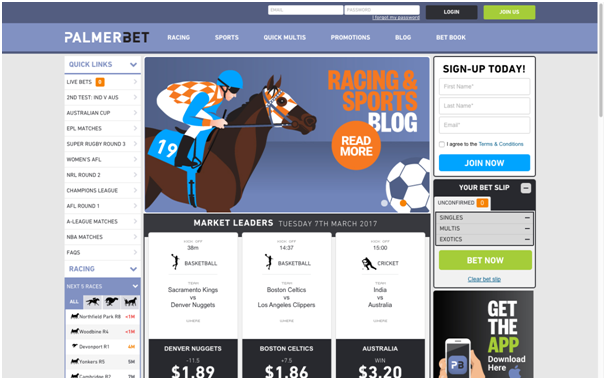 Palmer bet is Australian betting site by Palmer brothers who are Sydney based and are among the city’s biggest on course bookmakers. 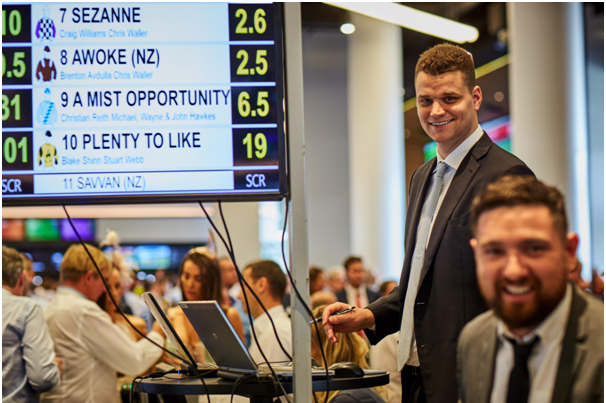 Now with their online presence that offer interactive and fairer betting experience for all punters, and commit to offer better odds with bigger limits. 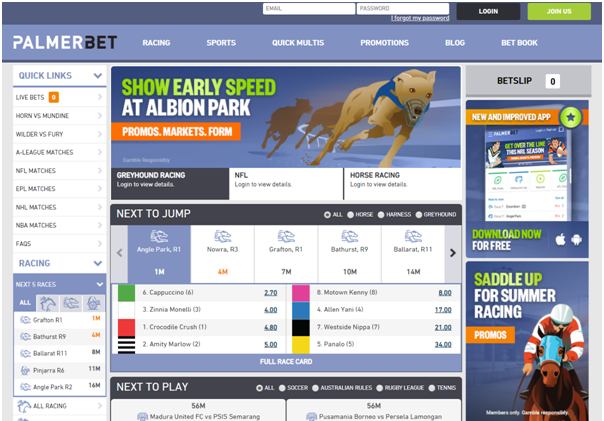 Palmerbet is owned and operated by Palmer Bookmaking Pty Ltd. 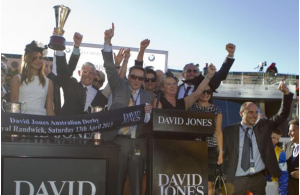 The company and directors, Grant and Andrew Palmer, are licensed by, and operate under the regulation of, Racing NSW. Palmerbet is also regulated by the NSW Office of Liquor, Gaming and Racing in respect to Sports Betting. Palmerbet operates from offices at Canterbury Racecourse, NSW, Australia. You can bet on different horse races and sports to be like Rugby Union, Soccer, Basketball, Boxing, Cricket, Cycling, Darts, Golf, Gridiron, Ice hockey, Marital Arts, Motor Racing, Netball, Snooker, Surfing, Tennis and various others. You can place different type of bets. Win/ Place Fixed: Wagers placed at Fixed Odds are paid at the odds quoted at the time the bet is placed. If a there is a scratching after a fixed odds bet is placed deductions may apply. Best of the Best (BOB): Guarantees the highest dividend of the Top Fluctuation and the Best Tote Dividends. For each way bets, the place portion is paid at middle tote. Available on select Metropolitan meetings where betting is available up to 30 minutes prior to each race. Maximum bet per runner of $250. Best Tote (Win/Place): Best Tote Win guarantees a win dividend equal to the highest Win dividend of all 3 Australian totalisers. Best Of Two (Win/Place): Guarantees a win dividend equal to the highest Win dividend of the NSW and SUPERTAB totalisers. Tote + 5% (Win/Place): Tote +5 % will be paid as the dividend from the SUPERTAB tote plus the nominated percentage bonus based on the Winning portion of the bet. Top Fluc: Pays the best price fluctuation determined by the jurisdictions official price (ie NOP, SAOP VOP, QOP) where available, otherwise the VOP will be used. Note Top Fluc bets may be subject to deductions if there is a scratching. Top Fluc betting will be provided up to 35 minutes before a race. Best Tote + SP: Guarantees a win dividend equal to the highest win dividend of all 3 Australian totalisers + Starting Price (SP) as declared by the jurisdictions official price (ie NOP, SAOP VOP, QOP) where available, otherwise the APN. Best Tote + SP is available on select horse races. For each way bets, the place portion is paid at middle tote. Middle Tote (Win/Place): Guarantees a win dividend equal to the 2nd highest Win dividend of all 3 Australian totalisers. Tote + 10% (Win/Place): Tote +10% will be paid as the dividend from the SUPERTAB tote plus the nominated percentage bonus based on the Winning portion of the bet. Exotics: Exotic betting is available on the dogs, trots and gallops, from Australia and a number of other continents. Exactas, Quniellas, Trifectas First Fours and Quadrellas pay the dividend declared by the SUPERTAB for all race meetings. How to get started at Palmer bet? Getting started is simply easy. Either start with PC or mobile that’s your choice. Simply type the URL https://www.palmerbet.com on your web or mobile browser. 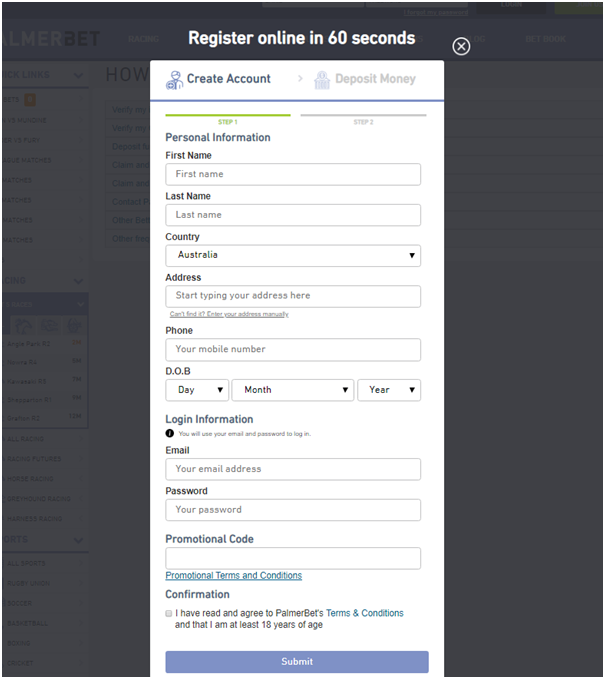 A short form as shown above will open for you to fill in your few personal details. 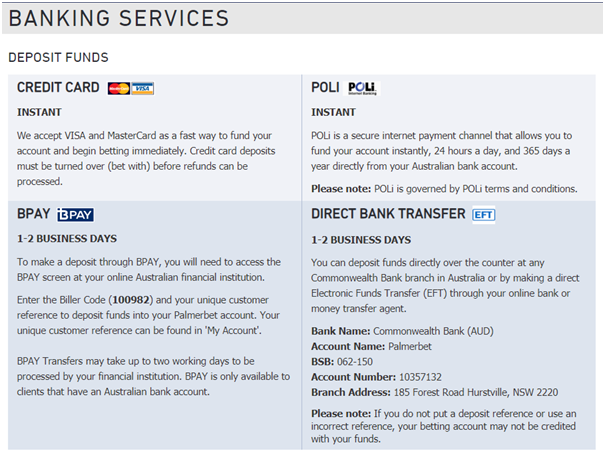 You can deposit your funds for betting with Credit Card, POLi, BPay and Direct Bank Transfer. Now simply go to the menu of games and buy the betting slip of sports or races you want to bet. You can place wagers on sports & racing via the telephone & Internet. It’s as simple as logging into your Palmerbet account or telephoning 1300 123 BET (1300 123 238). When placing wagers over the phone or online, you’ll need your User ID and password. So make sure you keep these details secure at all times. The minimum bet at online site is $1 and the minimum phone bet is $10. As said above you fund your account by different Aussie friendly deposit options like Credit card ($10), POLi ($10), BPay ($25) and by EFT or Bank Deposit. If you win you can withdraw funds from their Palmerbet account into your nominated bank account. To process your withdrawal request you must first satisfy their identification requirements. To verify your identity follow the steps outlined under ‘My Account’ once logged in. Members can use items such as a passport, licence, Medicare card, Tax File Number and so on until 100% is reached on the green status bar. If you are unable to successfully verify your identity via the above method (online), you must send in primary certified identification (photo ID) with address confirmation within 30days of opening your account or prior to any withdrawals being requested against your account. In line with government regulation, failure to meet these requirements will result in the your account being suspended until providing such documentation. You can talk with the customer support from Monday to Saturday 8AM TO 6PM and call 1300 12 HELP or call at 1300 123 BET to place a bet. To open an account you can call 1300 12 HELP or 1300 124 357. You can also send them an email at CONTACT@PALMERBET.COM or even write to them at their postal address PO BOX 1036 CRONULLA NSW, 2230.